Inspired by the historical architecture of Chantilly the hotel is Located in the city centre and overlooks the square ‘Place Omer Vallon’. It is just a 10 minute walk to Chantilly’s famous chateau and racecourse. 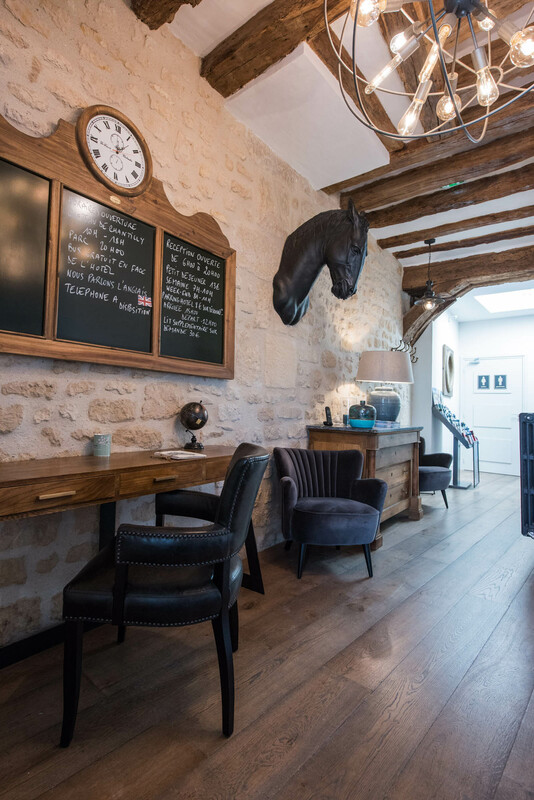 The Hotel Le Chantilly occupies the recently renovated (2016) Ancient post station, which was built at the end of the 18th century. The proprietors have endeavoured (every detail has been considered) to keep many of the old features of the building (stone walls, beams, original fireplace) yet also incorporate many modern needs of todays travellers to create an atmosphere and a feeling of intimacy and comfort. It even has its own library. All 20 rooms come on a Bed and Breakfast basis and have recently been updated to a high standard. A personal welcome awaits visitors to Hotel Le Chantilly. The aim is to give guests a feeling of a homely and relaxed stay. For a gateway or a business trip, the hotel « Le Chantilly » invites you to a unique experience. Enjoy our quality furniture and our assistance that will allow you to have a delightful stay. By car: From Paris, take the A1 motorway towards Lille: exit N ° 7-Chantilly / Survilliers, follow signs for Chantilly. The hotel is about 15 kms from exit N ° 7. By Train: By RER / TER from Paris Gare du Nord, take 20 minutes by car, (then 12 minutes by foot to the hotel). By Plane and TGV: Charles de Gaulle Airport is 29 km from the hotel; Orly Airport is 69 km from the hotel. By indicating your e-mail address above, you agree to receive our commercial proposals electronically.